Great title, great episode, great Scott! “Doctor Who” came back last night with a bang – and one of the better pre-credit teasers of recent years. It’s difficult to talk about the episode at this early stage, partly because we’re still in spoiler territory for people who didn’t watch the episode last night as it was broadcast and partly because “Who” show-runner Steven Moffat’s patented Timey-Wimey causality tango really did a number on your noggin throughout the episode. Moffat is a master of plotting, of disguised foreshadowing, of crafting carefully planted suggestions and nuanced asides which slip by in a story almost unnoticed until they come into play later on and become vitally important. In “Let’s Kill Hitler”, Moffat’s story introduced a character who was in fact somebody that we were absolutely familiar with already and even dangled a honking great clue in front our eyes as to the identity of this person. Moffat is a great storyteller because he rarely (if ever) cheats you – he’ll obscure details, withhold information and send you down the wrong path, but he delivers the goods and makes his conclusions satisfying. Things that I loved about the episode? Well, we’re in mild spoiler territory as I really enjoyed the fact [SPOILERS] that the title is something of a misnomer. Hitler’s kind of comic punching bag – he probably figures for perhaps two – three minutes of the episode’s total running time. [SPOILERS END] Though some internet commentators wondered about the wisdom of introducing a figure as historically contentious as Adolf Hitler into family friendly “Who”, the incorporation was done in such a way as be completely inoffensive. Karen Gillen did double-duty (watch the episode to find out how that works), Arthur Darvill continues to turn the once put-upon Rory into this series’ equivalent of Hogwarts MVP, Neville Longbottom. Rory might have begun his journey with the Doctor and Amy very much in their thrall, but he’s developed into a fantastic and most unexpected hero – the matter-of-fact Brit Bloke who sees incredible danger, bizarre circumstances and causal insanity and just gets on with it. Greatest, Not Technically Living Englishman or what? And as for River Song/Melody Pond/Keyser Soze – that’s a whole different kettle of fish fingers and custard. 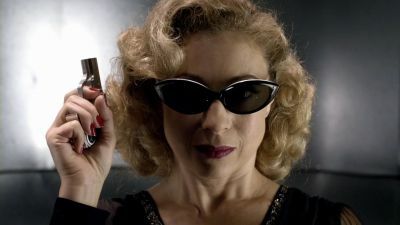 Alex Kingston is still doing sterling work – part-femme fatale, part-screwball comedienne, part-tragic, star-crossed romantic heroine and she’s always fascinating with it. The plot took us to different places last night, with the events and threats of “A Good Man Goes To War” villain Madame Kovarian [SPOILER] coming to pass – River had been raised as a weapon and was making good on Kovarian’s promise to bring the Doctor to his knees [SPOILER ENDS]. The arc plot continues to give information, without other stuff and set up more questions [SPOILERS] The Silence act as emissary for a religious order – so, are they working with the Clerics? [SPOILERS END] being posed. In short – loving it. It’s smart, poised entertainment the like of which most channels seems to have given up on making. Does it require you to pay attention? Yes, but since when has that been a bad thing? For my part, I would rather wrestle with the continuity-heavy “Who” than the banality of what passes for ‘mainstream’ drama on TV. Pro-Tip – if you’re having trouble keeping up with the Doctor – Wiki’s are your friend.